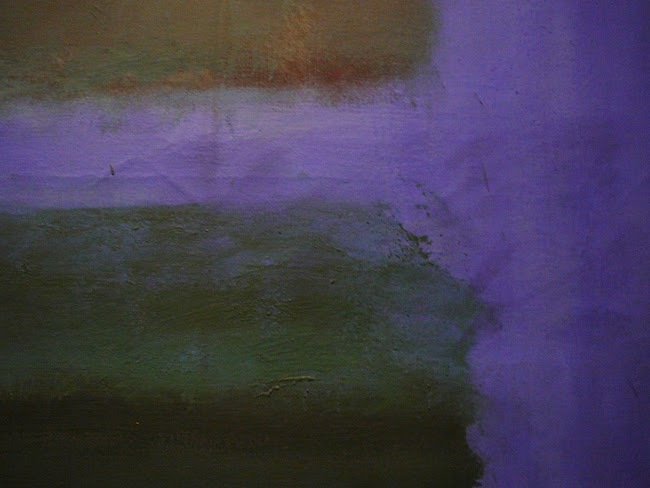 Bertrand Duchaufour’s new installment for The Different Company’s “La Collection Excessive” could be seen as the last panel in an iris/violet/leather triptych comprising La Traversée du Bosphore (L’Artisan Parfumeur) and Cuir de Nacre (Ann Gérard). Duchaufour conceived it both as a modern take on violet and as a vegetal leather. In this respect, I Miss Violet springs from the same intention as Jean-Claude Ellena’s Cuir d’Ange for Hermès: fashioning leather from flowers, and more significantly, breaking free from “perfumer’s leather”, i.e. the traditional ways of achieving the note as a cuir de Russie, or Bandit-style with isobutyl quinoline. Predictably, given the two men’s respective styles, the same endeavor has yielded radically divergent results. While Ellena’s angel leather is ethereal, radiant and powdery in scent and texture, Duchaufour’s leather violet is a dark, fatty flower grown in damp spring earth. This cuir de violette manages to be tough without smelling like biker leather: its toughness springs from its strong olfactory options. It is propped up by the “classic” leather base its author initially composed for La Traversée du Bosphore and tweaked for the new scent. But it is what fleshes out the leather base that gives I Miss Violet its distinctiveness: that trademark Duchaufour stance of working off the less appealing facets of his materials, in this case flowers with a leather facet, rather than trying to cover them up. If you’ve ever smelled violet leaf, osmanthus, cassie or mimosa absolutes, you’ll have noticed that beyond their shared powder and leather effects, they also give off whiffs of waterlogged plants – somewhere between snapped pea pods, old flower vase water and cucumber. To him, cucumber skin smells like eel leather, Duchaufour explained at the launch: so he bolstered the cucumber-y facets of his floral absolutes with even more green aqueous aldehydic notes. Osmanthus, a member of the Oleaceae family like the olive tree (or jasmine, for that matter), also contributes a black olive note it shares with castoreum. As a result, though it is smoothed out by a musk, vanilla and ambergris base, Violet smells like the uncanny hybrid flesh of plant and beast. The watery facets last little on my skin, but the vegetal effect persists well into the drydown, as does the apricot jam facet of osmanthus after the powdery sweetness of violet melts away. The scent has great naturality and though I wouldn’t call it sheer or “frothy” (as per the press release), it isn’t hemmed in by the dense dark tarriness of classic “perfumer” leathers. I Miss Violet is a beautiful weirdo, and with it, Duchaufour pulls off what he set out to achieve. Its trappings, however, are less convincing. 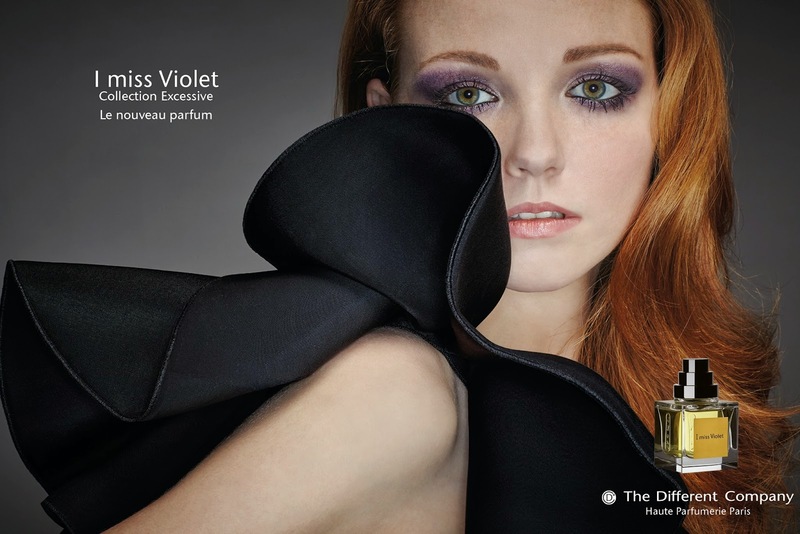 “Violet” being both a perfume note and a woman’s name, Luc Gabriel, the co-founder and owner of The Different Company, explains that “the name called for embodiment, and embodiment called for images”, he adds. So that Duchaufour’s purely olfactory project was saddled with a series of pictures featuring a feline redhead in violet eye-shadow, and with a story that reads like the synopsis of an advertising movie, that of the jet-setting “Violet”, who flits from Venice to Hong Kong by way of Paris before sailing off to an island near Java… and leaving her fragrance with a man who says he “misses her already”. The picture below is meant to be used in points of sale. Giving a fragrance a face, and giving that face a glamorous story? That’s what the mainstream does. And it’s bound to do it better than any niche brand, because mainstream brands have more money and more experience in the field. 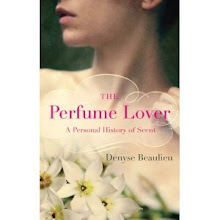 In moving into this territory, I feel that The Different Company is straying from the core values of auteur perfumery. The very values it contributed to shape when it was co-founded in 2000 by Jean-Claude Ellena, the designer Thierry de Bachmakov and Luc Gabriel. 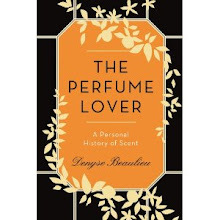 It was thanks to pioneers like TDF that perfumers went back to signing their work after being eclipsed by fashion designers for several decades. That they could disclose their actual sources of inspiration, and some of their work process, rather than have to answer questions like “what kind of woman did you make this fragrance for?” That they became the faces of fragrance. To be fair, the press material for I Miss Violet does prominently feature Duchaufour and his olfactory approach to the fragrance. And of course, TDF is not the only niche brand to produce images, and the issue of niche perfumery visuals would deserve a much lengthier development… For the moment, I’ll break off by saying that lovely though she is, “Violet” might be given a miss while I Miss Violet smells like a hit…After all it’s the perfumer who puts the “Different” in the Company. As soon as I saw the promo picture, which was before I read your accompanying words to it. Those were my thoughts exactly; why are niche brands now moving into mainstream territory... I would think that people most likely to buy their products do not want to be a 19 year old red hair wearing too much make-up. I'm saying brandS because this is not the first time I notice it, and it actually makes me so annoyed that I would actively avoid the brands. But I suppose it's just the supporting the claims that niche is no longer niche. What a shame, you make I miss violet sound like it would have been worth sniffing. I know, I didn't particularly want to single out TDF since several other niche brands are doing it... And I did tell Luc Gabriel that what attracted me to niche brands initially was, among other things, the fact that the fragrances had no face. It seems the field is moving ever closer to mainstream codes -- though IMV itself is nowhere near them, and is well worth enjoying. So is I Miss Violet wearable in an everyday sense? Could it become a happy spritz and go or is it too unconventional? Hey! I'd say IMV is fairly easy to wear -- it's no M/Mink. The violet note keeps it within the codes of classic perfumery. Nozknoz, I was less than convinced by the L'Artisan "Explosion d'émotions" series, so I'm very happy indeed to love (and admire) Bertrand's new compositions. Ostara is another one: I'm rather obsessed with it. And I need to give Pichola (Neela Vermeire) a good wear -- at least to wear the few drops I've got! That collection felt like a bunch of good ideas that hadn't been sufficiently developed, or lacked direction from the brand... Even great perfumers need sparring partners sometimes! You're so right the support marketing material is quite disappointing especially when you deem this fragrance to be a beautiful weirdo.I'd really have expected something more abstract,subtle and intelligent,truly creative not giving us such a mediocre image instead.Quel dommage! It's certainly difficult to figure out how to produce images specific to niche -- from what I understand, the owners of TDF just went with what they felt like doing for this one scent. Yes, I met Roberto Greco in Lausanne when we both took part in an exhibition... Byredo, Arquiste and Aedes have given some thought to the matter -- Ben Gorham of Byredo wants go beyond still lives, for now the default setting for the best niche perfume visuals. If anyone can pull it off, it'll be him. Also thinking of Humiecki & Graef who did interesting work on the theme. I ended up buying I miss Violet, and your description of it is spot on. That vegetal fattiness, the powdery, apricot jam aspects, the naturality, the "hybrid flesh of plant and beast". Wonderful! It is hellishly expensive, even if I bought it for less than retail price, but it's fascinating and very alive. It almost glows! I'm glad my description inspired you -- and that you "read" the same things in the scent. It's actually a semi-finalist for the French Fifis in the niche category, which features no less than 3 Duchaufours out of 12 pre-selections!